My turn. Steve got things started here last month after the house sold but it took me a bit longer. The intervening weeks were filled with packing and sorting and moving, with organizing, reorganizing and then reorganizing again. Without help from Nicole and her friends, and Dennis and Nancy, I don’t know how we could have met the one week window we had to be out of the house. It was a crazy busy time and we are so grateful for everyone who stepped up to help us get it done. We didn’t go far when we left, just one mile down to the campground where our adventure here started five and a half years ago, next to the beautiful lake that used to be a river. 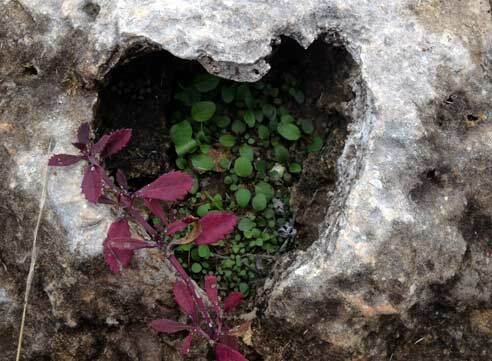 The photo of the limestone heart rock above was taken down at the shoreline. So fitting! There were also a fair amount of “until-we-meet-agains” (I don’t do goodbyes) and lunches with friends, interspersed with annual bird counts and Canyon Gorge docent commitments. And a couple of nights camped at the beautiful home of our friends, Joe and Jeannie. Their hospitality means so much to us. Once again, we are grateful. I love it here. Thankfully, the Army Corp offered us a volunteer position up at the Lake Office for the month of March so our wanderings will be short before we get a chance to check back in. February will be a shake-down cruise of sorts. And that brings me to today. More than two weeks out, back on the road as “full-timers”, we have finally left Canyon Lake. We still didn’t go far, only about 75 miles, but in some ways it is another planet. No longer in the Hill Country, and not yet on the Gulf Coast (where we plan to spend most of the month), we are surrounded by a leafless winter woodland, a river and, most notably, a palmetto swamp. Today is cold and blustery … perfect for writing inside our cozy, colorful, homey trailer. Still, the space is small. Dogs need walked and there are birds outside. Somewhere out there, I know there is Pileated Woodpecker just waiting for me to find it. Let the fun begin!